Marine mammals just won protection from harmful naval sonar. It's great newsâ--âbut there's more work to do. Do we have to kill and maim some of the most majestic creatures on earth to defend our seas and shores? No, we don'tâ--âand now we have a federal court settlement to prove it. 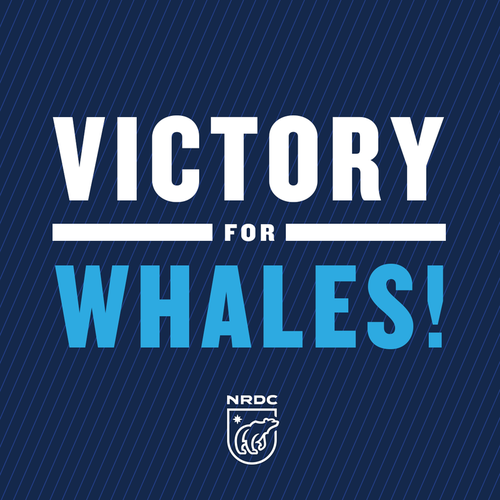 After years of litigation, NRDC and our partners reached a legal settlement requiring the U.S. Navy to take common-sense measures to protect endangered blue whales and other marine mammals from needless harm and hazard during training exercises and testing operations off the coasts of Hawaii and Southern California. For decades, far too many of these animals have suffered from the navy's use of powerful sonar and high explosives undersea. As marine mammals depend on their finely tuned sense of hearing to survive, sonar and explosives can cause injuries or impair their ability to communicate, navigate, and find food. They can go silent, become panicked, or be driven from their habitats. In some cases, high-intensity sonar has caused whales to beach themselves in large groups or left them with serious injuries. As a result of the settlement, spelled out in a September 14, 2015, order from the U.S. District Court of Hawaii, the U.S. Navy must cease using sonar and high explosives in waters critical to the most vulnerable of these creatures. Captains and commanders must plan their expeditions and steer their vessels to give a wide berth to whales in these areas. Naval security and readiness remain sound. The commander of the Pacific Fleet may override these measures if necessary for national defense, provided such decisions are made public afterward. This settlement shows the way to both protect our fleet and our whales, ensuring the security of naval operations while reducing the mortal hazard to some of the most magnificent animals on the planet. Our navy will be the better for thisâ--âand so will the oceans our sailors defend. That's good news for the hundreds of endangered blue whales that return each year to feed off the coast of Southern California. The world's largest creatures, blue whales can grow up to 110 feet long and weigh upwards of 330,000 poundsâ--âas much as 100 Chevy sedans. They were hunted to near extinction, though, and are now endangered, with as few as 10,000 estimated alive in the wild. It's good news for beaked whales, champion divers that can plunge to depths of 9,000 feet or more in search of fish and squid. And it's good news for the many small populations of whales and dolphins that cluster around the Hawaiian Islands. Now there's more to do to protect these great mammals of the seas. First, we need to build on the safeguards in waters off the coasts of Hawaii and Southern California by expanding the range of protections to address naval operations elsewhere. The waters off the southeastern United States, for instance, from the coasts of Virginia to central Florida, provide important habitat for whales and dolphins. They, too, need protection from the threats of navy sonar and explosives. This is especially important, as the region could soon be bombarded with high-energy seismic testing for proposed oil and gas drilling. And we need to protect the Atlantic and all it supports from the risk of a BP-style blowout. Next, we need to protect important whale habitat on other U.S. Navy ranges: off the coasts of Northern California and the Pacific Northwest, in the Gulf of Alaska and the Gulf of Mexico, and off the Marianas Islands. Finally, the navy needs to adopt whale-safe operations permanently, beyond the life of the court settlement, which sets terms through the end of 2018. We're fortunate, as Americans, to be defended by the finest navy the world has ever known. We're indebted to the men and women who bravely serve our country on the high seas. We're prouder, still, on this day, to know they're doing so in a way that honors the sanctity of the waters they've vowed to protect and all the wondrous life those waters support.